After few rounds of feedback from colleagues and debating with myself, I completed the final design for two new embedded TCP/IP boards. The first batch of printed circuit boards are in the final steps of fabrication and I'll have them soon to complete assembly and testing. Both boards will have a 16-bit Microchip PIC24HJ128GP202 as the main processor, same form factor and almost identical pcb layout, and same pin-outs. 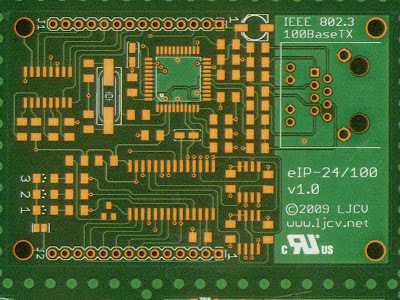 The eip24 shown above will have a Microchip ENC28J60 10BaseT Ethernet Controller, a 16Mbit SPI Flash memory and a Microchip 25AA02E48 EEPROM with a unique Ethernet MAC Address. 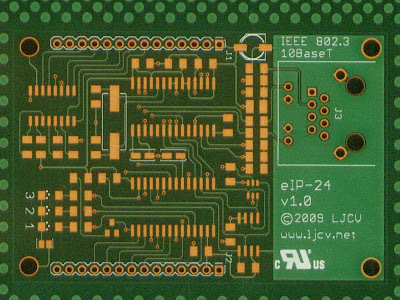 The eip24-100 shown above will have aMicrochip ENC424J600 10/100BaseT Ethernet controller, a 32Mbit SPI Flash memory, and a Microchip 23K256 SPI RAM memory. Both boards will also have three LEDs for heartbeat status indication or other use, and an RS232 transceiver for the serial interface. On the drawing board and prototype bench I've right now a piggy-back board that will be compatible with both the eip24 and eip24-100 and that will have a 3x16 DOGM LCD, a microSD card socket, a temperature sensor, a 3.3V voltage regulator, some pushbuttons and a RJ11-6 for ICSP connection to an ICD2/3 or similar PIC programmer. I'll post another article with additional details of the piggy-back board and an update as soon as the final docs and the eip24 boards become available. Now it's time to go back to work on the firmware for them that will essentially be based on Microchip's TCP/IP Stack v5.10. ENC424J600 - nic424 Board in production ! !